Intended for industrial training for apprentices and in refresher courses for journeymen, this easy-to-understand book presents this technical subject in as nontechnical language as possible. Moves rapidly from the basic laws of electricity to control components and machines. 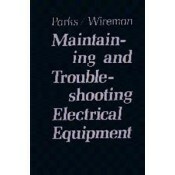 Provides valuable maintenance and troubleshooting hints. Contains in-depth, accurate information on basic electricity.